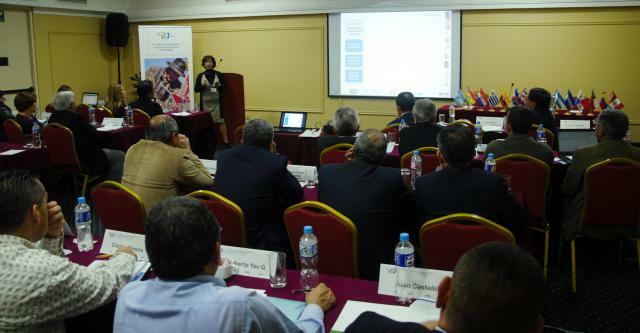 (Lima, June 23, 2016) From June 20 to 23, the 11th Workshop on Technical Monitoring of FONTAGRO Projects was held in Lima, Peru. FONTAGRO is a cooperation mechanism for the innovation of family farming in Latin America and the Caribbean. Representatives from 17 countries attended the workshop: Argentina, Brazil, Bolivia, Chile, Colombia, Costa Rica, Dominican Republic, Ecuador, El Salvador, Honduras, Nicaragua, Panama, Paraguay, Peru, Spain, Uruguay, and Venezuela. Peru’s Institute of Agricultural Innovation hosted the event, which was co-organized by the Inter-American Institute for Cooperation on Agriculture (IICA) in Peru. During the workshop, several strategic issues for the country and the region were discussed, experiences were presented, and challenges and opportunities for FONTAGRO’s member countries were analyzed. Within the framework of the event, a bioeconomy workshop covering the production and use of technology and knowledge for sustainably generating products and services was organized. It was co-organized by Spain’s national institute for agriculture and food research and technology Instituto Nacional de Investigación y Tecnología Agraria y Alimentaria, and experts from Argentina, Brazil, Spain, Costa Rica, Peru, and the European Union shared their experiences, seeking to create a regional platform for promoting bioeconomy policies for family farming. The platform is expected to adapt to the needs and realities of participating countries and it will prioritize training for farmers and their families. The 11th Workshop on Technical Monitoring of FONTAGRO Projects reviewed the progress of several projects that are under way. Researchers introduced innovations in family farming production and marketing in the Southern Cone, the competitiveness of Andean commercial fruit trees in Colombia, and a platform to consolidate beekeeping in Argentina, the Dominican Republic, Costa Rica, and Uruguay. Moreover, results were presented for such projects as the strengthening of small producers of organic bananas in Ecuador and Peru, rice farming practices, and the quality of cacao in Panama, Nicaragua, and Costa Rica. Lost Andean crops in Bolivia and Ecuador and the problems brought about by coffee berry borers in Panama and Honduras were presented at technical sessions. Also within the framework of the workshop, representatives and leaders from native communities in Peru’s Chanchamayo central jungle presented their work on managing coffee rust and how they have organized to handle the pest. Presentations included projects developed by researchers with a particular focus on actions carried out to protect family farming from climate change, such as an innovation platform to improve producers’ adoption of climate-smart agriculture in Colombia and Honduras. Other projects showed their progress on managing water resources in banana communities in Nicaragua and the Dominican Republic. In addition, researchers from Uruguay and Chile revealed the results of a pilot project on the quantification and mitigation of methane emissions from grazing cattle, developed by innovation institutions in Argentina, Chile, the Dominican Republic, Colombia, and Uruguay, and supported by New Zealand. Subsequently, a special meeting of FONTAGRO’s Board of Directors was held to review the development and progress of its 2015-2016 work plan. The delegation of member country researchers and authorities visited INIA Peru’s facilities to see the breeding center for small animals and sheep bread for meat. During delegates’ visit to the International Potato Center, they became acquainted with FONTAGRO projects and successful cases of adaptation to climate change in family farming in Peru, as well as with the famous seed bank, the largest in Latin America, which collects and protects more 4,500 potato varieties. On the last day, delegates took a tour of INIA’s Donoso Kiyotada Miyagawa agricultural experiment station in Huaral, in which they visited several biotechnology laboratories, experimental avocado and vegetable fields, and a processing plant for citrus trees that showed them how producers are linked with the products’ value chain. FONTAGRO is a unique regional cooperation mechanism that promotes family farming innovation, competitiveness, and food security. It was established in 1998 and it includes fifteen member countries that have contributed a capital of some $100 million. FONTAGRO is sponsored by the Inter-American Development Bank (IDB) and the Inter-American Institute for Cooperation on Agriculture (IICA). Its Technical Administrative Secretariat is based at IDB headquarters in Washington, D.C. FONTAGRO has cofinanced 108 projects and initiatives in its member countries for an approximate amount of $88.7 million, including contributions from other sources of funding and executing agencies. Its member countries are Argentina, Bolivia, Chile, Colombia, Costa Rica, Dominican Republic, Ecuador, Honduras, Nicaragua, Panama, Paraguay, Peru, Spain, Uruguay, and Venezuela.